We are a leading Wholesale Distributor of electromechanical actuators from Mumbai, India. Electromechanical Actuators convert electrical energy into mechanical energy. The common types of Electromechanical Actuators by their energy conversion mechanism are electromagnetic, electrostatic, and piezoelectric. In electromagnetics, the air gap separates a stationary member and a moving member of an Electromechanical Actuators. The amount of energy per unit volume of the air gap for magnetic fields can be five orders of magnitude higher than that of electric fields. The advantage of electrostatic is the higher switching rate and less energy loss. Electrostatic actuation is the main actuation for moving charged toner particles in electrophotographic processes. 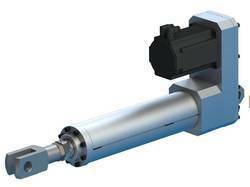 Looking for Electromechanical Actuators ?